Whether Wall Street is ready or not, veteran fund manager Larry Glazer warns a major shift is coming to the stock market. Glazer, who manages more than $2.5 billion in assets, acknowledged that the April jobs report didn't signal rising inflation — but it still exists, he contended in an interview. 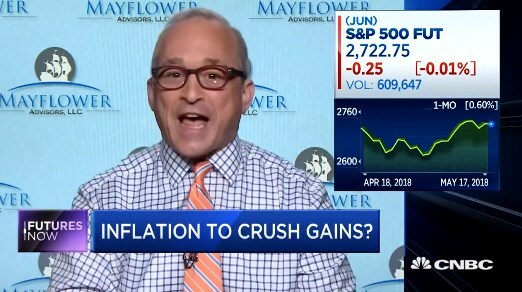 "Inconvenient truths include the fact that when you have that [a] plummeting unemployment rate and you add in the biggest tax stimulus in three decades, it's ultimately going to lead to higher wages and potentially inflation," the Mayflower Advisors managing partner told CNBC's "Futures Now" last week. Rising prices are "lagging data. It will show up in the months ahead," Glazer added. He also noted the recent spike in crude oil prices are starting to filter through the economy, and will create inflationary pressures. Recent evidence suggests gas prices are on the rise ahead of Memorial Day. "It will begin to affect consumers as the summer driving season kicks in," he added. Due to the emerging scenario, Glazer is advising investors to limit mega cap stocks and big tech exposure — groups that had been rallying as inflation and interest rates were at historic lows. "It's about re-positioning portfolios — recognizing the new paradigm," he said, advocating a more domestic approach to investing right now. He prefers small cap value, Treasury Inflation Protected Securities (TIPS), financials and energy. According to Glazer, they'll be the biggest beneficiaries of rising rates and an inflation comeback. If this environment feels feels too unsettled, he points out there's always cash. "A 2 percent money market sounds really great. It's actually outperforming a lot of areas of the stock market," Glazer said. "As you get a bout of volatility later in the year, you can re-position. Put that money to work." 0 Response to "Rising inflation will help produce a 'new paradigm' in markets, Mayflower's Larry Glazer says"